With statistics showing that most travellers will be struck down by illness while abroad, being prepared can be the difference between having an enjoyable holiday or the trip from hell. From traveller’s diarrhea to skin problems, fever and infections, travel bugs can bite in many different ways but there is often a simple remedy to curb symptoms as soon as they strike. Healthy Life Nutritionist Madeleine Memmolo said regardless of age and health, overseas travel carries risks. “Unfortunately, the statistics suggest that diarrhea, vomiting and other illnesses are an inevitable part of travelling. The risk of certain travel bugs can increase with the destination and season of travel and at the riskier end of the spectrum are some of the most popular destinations for Australian holidaymakers including Asia, Africa and Central and South America,” Madeleine said. 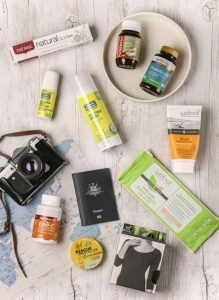 Here’s Healthy Life’s travel checklist to help Australian holidaymakers be as healthy while they’re away, as they are at home. New environments, foreign pathogens and changed sleeping patterns can put our immune system under the pump. Keep some Vitamin C on hand for an easy, daily immunity boost. Getting sick is the fastest way to spoil a long-deserved break. When the first sniffle or throat tickle hits, tackle it head-on with an immune-supporting antiviral supplement. Probiotics are an essential part of keeping your gut healthy, especially when trying new and exotic foods. Herbs of Gold Probiotic + SB is the perfect companion for a travel bug, containing a useful blend of probiotics including Saccharomyces boulardii (SB), which can help reduce the risk of mild traveller’s diarrhoea. An antiseptic spray is a must for any traveller’s first aid kit. Known for its antibacterial, antifungal and antiviral qualities, tea tree can help with cuts, burns and minor wounds, as well as fending off bed bugs, mozzies and other creepy crawlies. A spot of tea tree can also help zap any pesky pimples that arise during travels. Every traveller needs a good hand sanitiser and this one does the job naturally without the usual chemicals found in common gel sanitisers. It also has a lovely scent, which makes it much more pleasant to use in close quarters such as trains or planes. There’s no need to compromise on hair care or natural skin care while travelling. MooGoo’s all-natural travel minis include body wash, shampoo, conditioner and moisturiser and come in a leak-proof zip pouch that easily fits into carry-on luggage. To protect its coral reefs, Hawaii has banned sunscreens containing some chemicals. Travellers can do the right thing by the natural environments they’re visiting and their health by stocking up on natural sunscreens before they go. Keep pesky mozzies and other insects at bay with this all-natural repellent. Containing tea tree oil and citronellal, it repels insects the natural way and can also help soothe insect bites. To tackle all the thrills and spills that come with travel, every traveller should keep a travel-size pack of wet wipes handy. From a quick brow mop or make up removal on-the-go to wiping sticky fingers or cleaning a surface, wet wipes have myriad uses. Routines are inevitably disrupted during travel but it’s important to keep teeth and gums healthy. Red Seal’s Baking Soda toothpaste comes in a handy 100g tube and doesn’t contain chemicals so travellers can maintain their natural health routine while jetsetting around the world. Bamboo clothing, with its antibacterial, antifungal, breathable and odour-resistant qualities, is made for travelling. It’s also lightweight and comfy making it perfect for plane, train and automobile journeys. Stress is inevitable when travelling. As glamorous as it looks, travelling can have its fair share of setbacks and plans often go awry. Being away from home can also cause some people to feel anxious and out-of-sorts. Bach Rescue Pastilles are a special blend of bach flowers which can help with feelings of stress and anxiety. They come in a handy travel tin so relief is always within reach.